Here is a recording of Hymn No. 29 from the “Hymns of Dawn” to aid God’s people in singing and making melody in their hearts unto God. A beacon light hangs out for thee. Soon shalt thou share thy Saviour’s throne. Bright is the promised shining way! Lo! ’tis the dawn of perfect day. And send it forth that all may see. We are to put on the “armor of light.” Consider the light you have now received—the light of the knowledge of God, of His will, of what to live for, and of what kind of characters they are to whom the Lord will be pleased to grant the reward of eternal life, even the highest form of life. Having all this knowledge, put it on as an armor to protect you. Knowing what God requires, put all this on, not as a robe, but as an armor over the robe. Put on the breastplate of righteousness covering the heart. Realize that nothing but heart-purity and absolute loyalty to God may be considered. Realize that God is for us. Take the Sword of the Spirit, the Word of God, and all the various pieces enumerated by the Apostle. These constitute the “armor of light,” so called because it is obtained from the light of Truth. In this our day it is surely as important that we should put on this armor and should put off the works of darkness as for the Church of the Apostle’s day. Surely if ever the whole armor was needed, it is needed now. The Lord’s dealing with us is individual—both as to the putting off of the works of darkness and as to the putting on of the armor of light. All who put on this armor will find themselves in accord with the Lord and with those who are truly His. As God’s faithful children get farther and farther into this Day of the Lord, more and more will they see eye to eye. We believe there never was a time when so many of the Lord’s people have seen eye to eye regarding the things to put off and the things to put on. We believe there never was a time when so many of the children of the light were wearing the whole Armor of Light. Therefore we have so much the more responsibility to “walk as children of light” and not as of the night. It is possible that some, even of the fully consecrated children of God, surrounded with the cares of this life, or weary of the struggle against sin and evil, or somewhat beguiled by the present things of time and sense, may have become more or less drowsy, and so stand in special need of the stirring exhortation which the Apostle in this connection gives to the Church—particularly appropriate today: “It is now high time to awake out of sleep!” It is time for earnest, searching self-examination, for a more diligent watching to see that we do not allow the things of this “present evil world” to absorb our thoughts and energies to the imperiling of our Heavenly hopes, so soon to be realized if we remain wholly faithful to the end. It is highly important that we seek for a still closer walk with God, a more intimate fellowship with Him, a more thorough self-abnegation, a more diligent cross-bearing, a more faithful conformity in every respect to the whole will of the Lord concerning us. And this will of the Lord, we know, is not unreasonable, and His grace sufficient is promised for every day, every hour, every moment! A careful, prayerful searching of our hearts will make plain wherein we lack in conformity to the perfect will of God. And if we discover in ourselves any perverse way, we shall correct it. Thus we more and more “put on the Lord Jesus Christ”—the mind or disposition of Christ, the spirit of love and loyalty which characterized Him. How important it is, in the very short time which yet remains to us, that we fully awake and apply ourselves most diligently to the cultivation of the Godlike, Christlike disposition of Love, the love which seeks above all else the glory of God, which is kindly-affectioned toward the brethren, which rests in the precious promises, which trusts fully in the dark as well as in the light, and which has no shadow of doubt that all the good things promised in God’s Word shall be fulfilled! In the context St. Paul urges, “Let us walk honestly, as in the day.” He was speaking of certain vile practises then common—drunkenness, rioting, chambering, wantonness. We are not necessarily to suppose that he meant this as a reproof to the Christian believers at Rome, but as a pastoral exhortation that they should be on guard against these sins, and as a reminder that the principles which they had adopted as Christians were in direct contrast to those which generally prevailed. Very different standards of morality were current among the heathen. Quite a large number of the believers at Rome had been heathen and accustomed to immoralities. Hence the Apostle’s words were words of caution; for we would not suppose that saints would be guilty of these things. The Apostle’s words above shed a warning light in saying, “Let us walk honestly, as in the day.” Most of the rioting and drunkenness is done at night—such is the custom even to this day. Works of darkness and sin thrive best at night, for some reason. People have other things to attend to in the day-time, and evil-doers take the night for frivolity or carousing or crime. Vice then stalks abroad. Darkness seems to favor such works, by hiding them more or less. The Apostle points out that this is the great night of darkness, sin, but that those in Christ are not in darkness; for they have been brought into the light of God. We are looking for the full dawning of the Morning of the New Dispensation—we are seeking to live in harmony with it. So here he says, Let us walk honestly, above-board, so that everybody will see and know our lives—let us be honest in every way, not be preaching one thing and practising another. Considering the day here mentioned to be the Millennial Day, we may well say that nothing in the nature of sin will then be allowed. “For out of Zion shall go forth the Law, and the Word of the Lord from Jerusalem.” (Micah 4:2.) “Judgment also will I lay to the line,” says Jehovah, “and righteousness to the plummet; and the hail shall sweep away the refuge of lies, and the water shall overflow the hiding-place.” (Isaiah 28:17.) Whoever in that Day shall attempt to live riotously and in drunkenness or in any sin will be promptly punished. The Apostle’s exhortation is that we, as saints of the Lord, should live as those will be living when the Day shall have fully come—when the Sun of Righteousness will be shedding its beams over the whole earth. It is a part of our overcoming to live as though the Day were fully ushered in, as though everything had been fully manifested. Whoever will take the Apostle’s advice in this matter will certainly have a rich blessing. In fact any other course would be sure to be disastrous to us as New Creatures in Christ! Only a little while, then comes the perfect Day. “Only a little while to spread the truth abroad. Only a little while, earth’s sorrows all are past. Only a little while, then comes the promised rest. Only a little while, oh, what a word is this! The Lord Is My Shepherd, (R.1396) — Reprints of the Original Watch Tower and Herald of Christ’s Presence. The Lord Is My Shepherd, (R.3268) — Reprints of the Original Watch Tower and Herald of Christ’s Presence. Acts 23:6—HOPE & RESURRECTION. Part A: What is Jesus All About? Reference Below:- PEOPLES PULPIT ASSOCIATION, BROOKLYN, N.Y., U.S.A. COPYRIGHT, 1917. PASTOR RUSSELL is known the world around as the most celebrated preacher of modern times. When a young man of about twenty years of age he began to preach the Gospel of Christ Jesus, and continued faithfully to do so until his death, October 31, 1916. His explanatory writings on the Bible are far more extensive than the combined writings of St. Paul, St. John, Arius, Waldo, Wycliffe and Martin Luther—the six Messengers to the Church who preceded him. His sermons and other writings have been translated into many languages and are read appreciatively everywhere. All Christian people will concede that St. Paul was the greatest of the Apostles of Jesus Christ. He was the Apostle who averred to the Church of his day, “I have not shunned to declare to you all the counsel of God.” (#Ac 20:27.) St. Paul’s greatness was due to the fact that the Lord used him most wonderfully to enlighten others concerning God’s great Plan of Salvation for mankind. Since the days of the Apostle Paul there have been other great reformers in the world, other great exponents of the Scriptures. But when the history of the Church of Christ is fully written, it will be found that the place next to St. Paul in the gallery of fame as an expounder of the Gospel of the great Master will be occupied by CHARLES TAZE RUSSELL. In the first three chapters of the Revelation we are informed that to the Gospel Church have been sent seven special Messengers. Of these St. Paul was the first, and Pastor Russell the last. To him, as the Seventh Messenger, was granted the wonderful privilege of clearly presenting to the minds of the people the magnitude and the vital importance of the sacrifice of Jesus Christ our Lord, and of explaining how that sacrifice will ultimately bring a blessing to every man. Through the Pastor’s preaching multitudes have come to know that Jehovah God is not a fiend, as many of the creeds of Christendom imply, but a mighty God of Love. For a period of forty-two years Pastor Russell preached the Glad Tidings of great joy—a Message which must yet be heard by all, from the least unto the greatest. Those who heard him and had their hearts made glad by his Message passed it to others; and in time a public demand was created for Pastor Russell’s sermons. The public press furnished the medium through which this demand could be met. Then followed that which has never been duplicated in the history of the world—approximately three thousand newspapers published the Pastor’s sermons weekly. Approximately ten million people were reached every week by these newspapers; and doubtless many thousands read the sermons. The good thus accomplished will never be fully known until all things are revealed. For many centuries the world had been deprived of the opportunity of Bible study. That period has well been styled the Dark Ages, during which there prevailed great darkness in the world and gross darkness upon the people. The clergy of both Romish and Protestant churches had induced the laity to believe the God-dishonoring doctrine of eternal torment—that the soul of man is immortal, that therefore death does not mean death, but only a change of condition, and that all except a very few would spend eternity in a hell of fire and brimstone. The Lord has used Pastor Russell to remove from the minds of thousands this foul stain upon the name of Jehovah. His discourses have made luminous many of the dark places of the Bible. They throw a flood of light upon the Word of God, making it a new Book to the faithful and prayerful student. In simple and beautiful language these sermons disclose God’s dealings with man from the dawn of creation to the blessed days of restoration of all things spoken by the mouth of all the holy Prophets of Israel. They show why God has permitted evil in the world, how long evil will persist, and who will profit by experiencing it. They also show God’s wise provision for the redemption, enlightenment and complete blessing of all who accept the Divine blessings upon the terms proffered. In these sermons the Pastor points out why this great Time of Trouble upon which we have entered has come upon the world, what its result will be, and what blessings will accrue to all peoples and nations that are properly exercised thereby. Thus they are indeed a balm for the broken-hearted and a comfort for those that mourn. Blessed is he who reads them with unbiased mind! During the term of his ministry CHARLES TAZE RUSSELL was pastor of a large congregation at Allegheny, Pa.—now a part of Pittsburgh; London Tabernacle, London, Eng. ; and of The New York City Temple; and was elected pastor of over 1200 other congregations. His reputation was international. His sermons were published in more than thirty languages. He was indeed the world’s ubiquitous preacher. On October 31, 1916, after a most eventful career, Pastor Russell finished his work on earth. Suddenly the order-loving peoples of the world learned that a great force for good had been removed from their midst. An aching void was left in many hearts, and thousands of people have continued to hunger for more of that precious mental and spiritual food which his discourses had supplied. To meet this demand, and as a lasting monument to the memory of Pastor Russell, we issue this selection of his sermons in book form. Some of these have never before been published. St. Paul under inspiration wrote that at the end of the Age would come greater light. Pastor Russell was privileged to live in the close of the Gospel Age; and as a chosen vessel of the Lord he was permitted to point many thousands to the illuminated pages of the Divine Word. In fulfillment of St. Paul’s prophetic statement, and as a result of Pastor Russell’s preaching, thousands of people today are enabled to see that God has a great Plan which He is working out in an orderly manner, and which will culminate to His glory in the blessing of mankind. In these sermons Pastor Russell gives clear proof from Scripture that the Secrets of the Lord can be understood by those who, trusting fully in the merit of Christ Jesus, have made a consecration to do the will of God, who have been accepted by the Heavenly Father and who then apply themselves studiously to understand the Divine Plan. Christian people have long been confused upon many questions; such as, What is the condition of the dead? Is there hope of salvation for any aside from the truly consecrated? What will be the office of the Church in the ages to come? The reader of these sermons will see that Pastor Russell makes these questions clear, answering them to the satisfaction of all honest minds. He magnifies the merit of Christ Jesus’ sacrifice, and shows that in due time every man will receive the benefit accruing from the Ransom-price and will be given one fair, impartial trial for life. Long before the great international war began, Pastor Russell fore-showed in his sermons the coming trouble upon the earth, made clear from the Scriptures the cause of the war, and pointed out what would be the result and what would follow after the trouble had subsided. Both Christians and those who have never claimed to be Christians will find much satisfaction in reading these sermons. Order-loving Christians will desire to leave a copy of these discourses as a heritage to their children, that they may better understand God’s great Plan. It is our prayer that these sermons may prove a blessing to all who read them. – COPYRIGHT, 1917, PEOPLES PULPIT ASSOCIATION, BROOKLYN, N.Y., U.S.A.
1844 — Millerites expect Jesus’ return (October 22). 1852 — Charles Taze Russell born. 1868 — Russell begins careful study of Scriptures. 1870 — Russell forms Bible study group. 1876 — End of appointed times of nations in 1914 first announced. 1877 — Barbour and Russell publish Three Worlds, and the Harvest of This World. Russell publishes The Object and Manner of Our Lord’s Return. 1879 — Russell withdraws from Herald of the Morning. Zion’s Watch Tower first published. 1880 — Russell tours northeastern U.S. to form study groups. 1881 — First tracts published. Zion’s Watch Tower Tract Society formed. Groups holding meetings asked to notify Society. Food for Thinking Christians published. 1884 — Zion’s Watch Tower Tract Society incorporated. 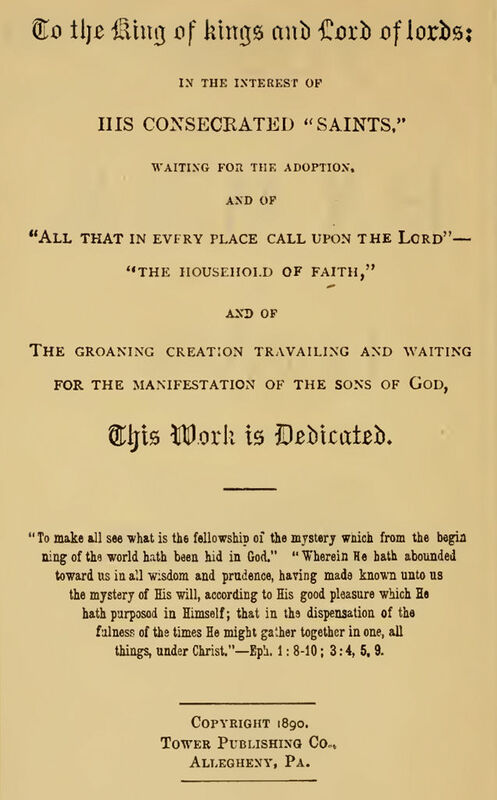 1886 — The Divine Plan of the Ages (Millennial Dawn, Volume I) released. 1889 — Bible House in Allegheny, Pennsylvania, completed. 1890 — Society begins Bible publishing with Rotherham’s New Testament, Second Edition. 1891 — First gathering of Bible Students to be termed a convention (Allegheny, Pennsylvania). 1894 — Speakers sent to congregations. 1895 — Dawn Circles for Bible Study begin. 1896 — Name Zion’s Watch Tower Tract Society changed to Watch Tower Bible and Tract Society. 1898 — Tower Publishing Company donated to Watch Tower Bible and Tract Society. 1900 — First branch office established (London, England). 1903 — Tracts distributed house to house. 1904 — Russell’s sermons appear in newspapers. 1909 — Watch Tower Society moves headquarters to Brooklyn. 1914 — “Photo-Drama of Creation” first shown. International Bible Students Association incorporated. 1915 — Pastoral work (aspect of field ministry) begins. 1917 — Joseph Rutherford elected president of Watch Tower Society. Opposition to Rutherford by four unconfirmed directors. 1918 — Joseph Rutherford confirmed as president of Watch Tower Society. Posted on December 14, 2018 December 14, 2018 by Bible Students DailyPosted in Hymns of DawnTagged A beacon light hangs out for thee, And all the midnight shadows flee, And send it forth that all may see, Arise! arise! the light breaks o'er thee, armor of light, awake out of sleep, be strong and courageous, Bright from thy everlasting home, Bright is the promised shining way!, christ in you, Christian the morn breaks sweetly o'er thee, Christlike, colossians 1:27, Counting all else but vanity, Dawning Day, day, Deuteronomy 1:21, Deuteronomy 31:6, do not fear, eternal life, fear not, fully consecrated, Godlike, He will not leave you or forsake you, honor and immortality, hymns of dawn no. 29, Isaiah 28:17, Joseph Rusling, let uslay aside the deeds of darkness, Lift up thy head, loyalty to God, Micah 4:2, only a little while, patience, Precious this truth; O seek and hold it, present evil world, put on the armor of light, put on the Lord Jesus Christ, R.5769, R.5770, Rejoice! rejoice! in hope of glory, Romans 13:12, Romans 2:7, seek for glory, Soon shalt thou reach thy goal of glory, Soon shalt thou share thy Saviour's throne, The Armor Over the Robe, the day breaks o'er thee, the day is near, the hope of glory, the night is almost gone, the riches of the glory of this mystery amongst the Gentiles, Tinged are the distant skies with glory, walk honestly. Next Next post: STUDY 10: The Furnishings in the Holy of the Tabernacle – THE LAMPSTAND.